We’re all waiting with bated breath to see what developments come out of Crimea in the next few days. Are we really, though? Some of it, at least, is probably already decided. The vote will be decided by a simple majority, with the option that gets the most votes winning. An idea of the environment in which the referendum is being conducted. 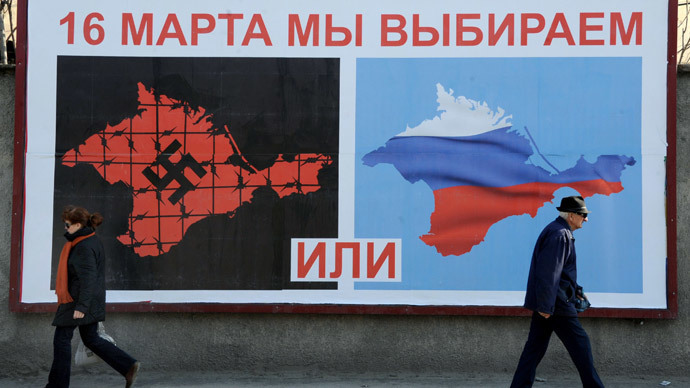 The top line reads “On the 16th of March, we choose.” The images imply that the voters choices are either Crimea under Nazi occupation or Russia. Note that both images exclude the land linkage to Ukraine, eliminating it completely from the picture. The legitimacy of the referendum is up for debate. It is a clear violation Article III of the Ukrainian domestic law on referendums, which says that changing the borders of Ukraine can only be done via national referendum, not an exclusive Crimean referendum. The European position for most of the last two decades has been that ethnic minorities do not have the right to secede (with the exception of Kosovo), and Russia has strongly supported this position with regards to its own internal ethnic minorities. However, statements made by Ukrainian Prime Minister Arseniy Yatseniuk on his visit to Washington DC seem to indicate that the Ukrainian government would not be opposed to a national referendum on the status of Crimea if the “self-defence units” were withdrawn. When the votes are counted, Putin and Russia will have a decision to make about Crimea regardless of the outcome of the referendum. Putin’s reactions to other similar situations have provided some examples of what his reaction may be. If the results of the referendum indicate that Crimea would like to become a part of Russia, then it is highly possible that Putin will proceed with the annexation as planned. Already Russia has offered Crimea over $800 million in financial assistance (with smaller amounts allocated to other cities in the area) if it were to join Russia. The discussion over the construction of the Kerch Strait Bridge, a proposed bridge connecting Crimea and Russia, has once again heated up. Of course, annexation would require a certain amount of support from the Russian legislature, but statements issued from the upper house this week show that this would likely be there. To the rest of the world, this would be by far the most outright aggressive move. Certainly, world leaders like Angela Merkel and Barak Obama have made statements over the last few days indicating their disapproval of any potential annexation of Crimea by Russia (or any threat to Ukraine’s territorial integrity). However, the Obama administration has certainly been reluctant to issue an unequivocal statement as to what the US reaction to annexation would be, threatening no more than economic sanctions, which have not proven to be much of a threat to Russia in the past. Another possible outcome is that Crimea becomes a breakaway republic a la Transnistria – not a part of Russia and in possession of limited recognition. Transnistria is not recnognised by any UN member states, but the permanent Russian military presence means that it is de facto under Russian protection. If annexed by Russia, Crimea would almost certainly never go back to Ukraine. However, if Crimea were to go down the route of Transnistria – that is, to exist in a sort of limbo – there would be at least some potential for recovery by Ukraine in the future. The most unlikely conclusion of the Crimean referendum would be independence for Crimea (despite the fact that Crimeans seem to be most loyal to themselves). Russia attempted to achieve international recongition for Abkhazia and South Ossetia after the 2008 Georgia War, with limited success. Several UN member states recognised the two breakaway republics after heavy lobbying by Russia, however, their lack of recognition means that their economies are propped up largely by Russia. In the case of Crimea, with its much larger population, such a scheme would not be sustainable for Russia’s economy. During Ukrainian Prime Minister Arseniy Yatseniuk’s visit to Washington DC, he has emphasised the importance of maintaining Ukraine’s borders (despite statements that he would otherwise consider concessions to Crimea). US politicians have issued similarly tough language, threatening further sanctions if the referendum were to go ahead on Sunday, and European politicians, including Germany’s Angela Merkel, have strengthened their rhetoric and made remarks explicitly condemning annexation of Crimea by Russia. At the same time, however, statements from US Secretary of State John Kerry seemed to stress the number of wildcards involved in the criss and the hope of finding a diplomatic solution to it as long as Russia stopped short of actual annexation. While any alterations to Ukraine’s territory could not be done without the involvement of the Ukrainian government, statements from Washington do not preclude the possibilty of Crimea going to Russia with Ukrainian consent. Historically, Crimea has been Russian territory, and US foreign policy priorities at the moment do not have room for a major breakdown in US-Russian relations. Rather, Russia’s importantance to US negotiations in Syria and Iran make it all the more likely that the US will be willing to pressure Ukraine to make some concessions to Russia to avoid Russian-Ukrainian relations deteriorating further. For example, the US and Europe could persuade Ukraine to accept the Crimea referendum in exchange for Russia’s recognition of the legitimacy of the Ukrainian government and election process as well as Ukrainian territorial integrity. Avoiding outright military conflict would be a win for the US and Europe, as well as Russia, where Putin could spin reclaiming Crimea as a victory. The important thing to note is that there are a lot of factors in play here, and Russia is most likely looking for an excuse (like tonight’s clashes in Donetsk, supposedly escalated by pro-Russian protestors) to esclate the situation not only in Crimea but in eastern Ukraine as well.